Roof replacement takes a significant amount of your time and money. With the right choices, however, you can make this home improvement worthwhile. To achieve the lasting protection and performance you want for your home, be sure to choose the right roofing brand. 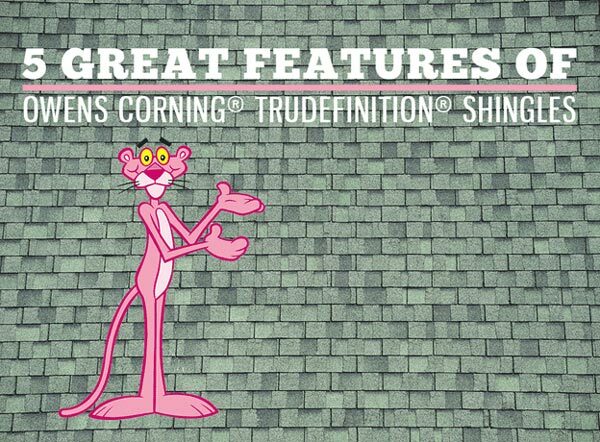 There are many options available, but one remains a favorite for Texas homeowners: Owens Corning® TruDefinition® shingles. Jones and Associates, one of the leading roofing companies in Michigan, shares five of the features you can enjoy from this excellent option. 1. SureNail® Technology—TruDefinition shingles come with advanced, patented SureNail Technology. This system ensures the strength and stability of the material through its unique fabric strip in the nailing area. It uses rigid, engineered woven fabric that our installers can use to embed in the shingle, creating a durable fastener zone. With SureNail technology, you can rest easy that your shingles will remain firmly in place no matter the weather. 2. Excellent Wind Resistance—High winds can blow standard shingles off your roof, leaving your home open to extensive water damage. You won’t have this problem with Owens Corning TruDefinition shingles from your premier Detroit roofing company, Jones and Associates. These shingles come with a durable sealant that helps these shingles withstand wind speeds up to 130mph. 3. Attractive Color Options—TruDefinition shingles are available in multiple granule colors and complementary shadow lines for a lovely, dimensional look. Their vibrant tones and dramatic hues make it easier to match your roof with your home’s existing style and décor. 4. ENERGY STAR® Certified—With our TruDefinition shingles, we’ll help you keep a more comfortable home, minus the high energy costs. They can reflect solar energy, greatly reducing the amount of heat that enters your home. This is especially handy during warmer Michigan months. 5. Solid Warranty—These high-end shingles come with Owens Corning’s lifetime limited warranty and our 10-year workmanship guarantee for your ease of mind. When you’re ready to enjoy the many benefits of this option firsthand, turn to one of the top Michigan roofing companies, Kroll Construction. With our Owens Corning TruDefinition shingles and our professional installers, we can ensure superior weather protection and lasting performance for your home. Call us at (888) 338-6340 or fill out our form today for a free estimate.